ICC has published its much awaited Incoterms® 2010 Q&A : Questions and expert ICC guidance on the Incoterms® 2010 rules, the latest in a series of best-selling books helping readers understand and use the Incoterms® rules to their strategic advantage. Incoterms® 2010 Q&A comprises more than 80 new and historical questions with expert guidance on using and choosing the correct Incoterms® 2010 rules. This helps readers avoid costly mistakes arising from dangerous mismatches between the contract of sale and related documents, such as letters of credit and contracts of carriage. The book includes 44 real-life users’ questions on the Incoterms® 2010 rules with responsive guidance by world-renowned ICC experts, and another 39 questions and answers on the Incoterms 1990 rules, providing a rare perspective on the evolution of these broadly used rules. The new publication also offers comprehensive flowcharts and checklists to help readers choose the correct Incoterms® rule and manage documents in an Incoterms® sale or purchase transaction, a glossary of commonly used trade terms, and the text of the Incoterms® 2010 rules in full. “Since being published by ICC in 1936, the Incoterms® rules have become the gold standard worldwide for the interpretation of most commonly used terms in international trade,” said Emily O’Connor, Executive Secretary of the ICC Commission on Commercial Law and Practice. “This latest instalment on the Incoterms® series, by the international body that drafts and maintains the Incoterms® rules, is an invaluable resource for everyone involved in cross-border transactions,” said Ms O’Connor. 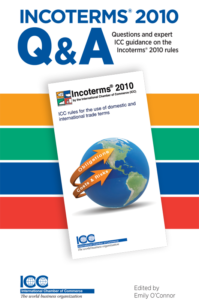 Get your copy of Incoterms® 2010 Q&A: Questions and expert ICC guidance on the Incoterms® 2010 rules from the ICC Bookstore.